Perform the steps in How to Install the Universal Rack Mounting Hardware in a Square-Hole Rack or in How to Install the Universal Rack Mounting Hardware in a Round-Hole Rack. Lift the server to its position in the rack. The use of a mechanical lift is recommended. Caution - The server weighs 180 pounds (82 kg). To reduce the risk of serious personal injury or equipment damage, use a mechanical lift to install the server into the rack. 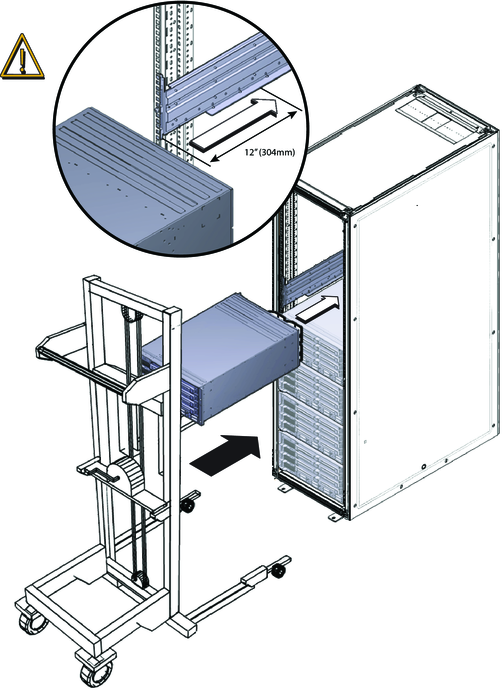 If a lift is not available, remove components as instructed in How to Remove Components to Reduce Weight, and use two persons to lift the server into place. Slide the server onto the shelf rails. Caution - Drop Hazard! Do not release the server until it is 12 inches (304 mm) into the rack, and is firmly supported by the shelf rails. 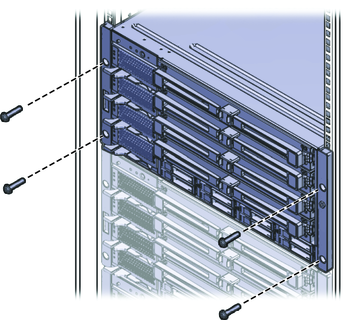 The shelf rails can not support the server until it is 12 inches (304 mm) inside the rack. Note - If the server is still on a pallet, you can leave it on the pallet and lift both the server and the pallet with the mechanical lift, and slide the server off the pallet and onto the shelf rails. 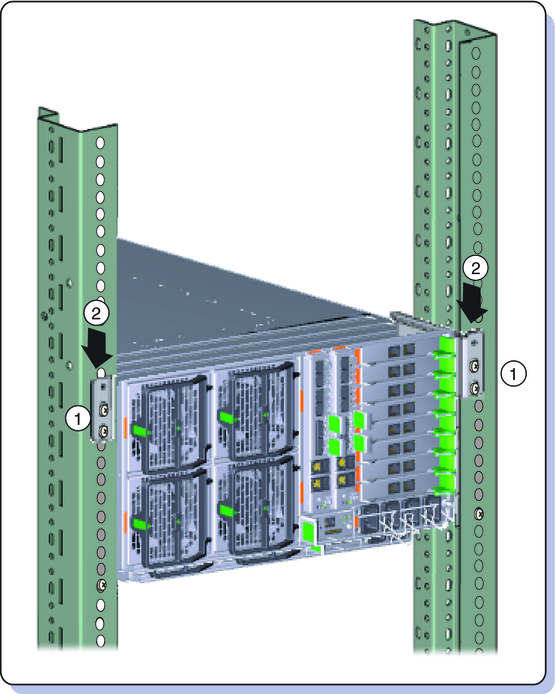 Use four screws to attach the front bezel of the server to the front of the rack, as shown in the following figure. For square-hole racks, use four M6 x 16 screws. For round-hole racks, use four M6 x 12, or four 10-32 x 10 screws. Note - On square-hole racks, the screws pass through the rack and thread into the adapter bracket. On round-hole racks, the screws thread into the rack rails. Move the rear braces so they are snug against the server chassis. See the following figure. Slide the braces down (2). If you removed components from the server, replace them after the server is mounted in the rack. See How to Replace the Components in the Server.